Below is a collection of infographics we've made here at ServerMonkey.com. Feel free to share them with your friends or use the embed code to publish them on your site. 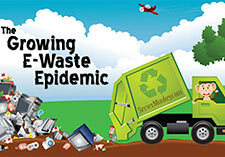 We've all heard that E-Waste is a growing problem around the world. Let's take a closer look at how much E-waste we accumulated in the United States in just the year 2010.